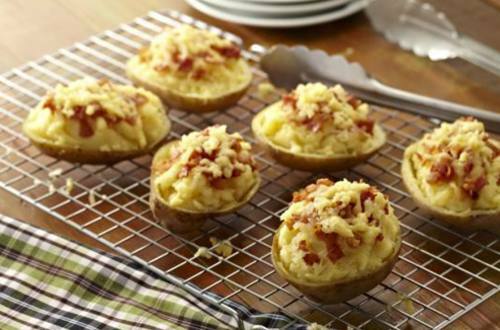 Jazz up your mashed potato by adding cheese, bacon bits and Knorr Beef Cubes. Serve on your next party and see how your guest will truly be impressed. 1 Get a pot and fill it with water. Add the potatoes whole and cook until very tender. Drain from liquid and place on paper towels. 2 Slice potatoes into half lengthwise. Using a spoon, carefully scoop the potatoes making cup-shaped potato skins, around 1/2 inch thick. 3 Place the scooped portions in a bowl and mash it well. 4 Add Knorr Beef Cubes, cream and, butter. Mix well. 5 Adjust seasonings and add the mixture to the cups topped with cheese and bacon bits (optional). 6 Bake this in an oven or oven toaster until cheese melts. See how your guests or family get excited when you serve Baked Potatoes Made Easy! It's delicious!